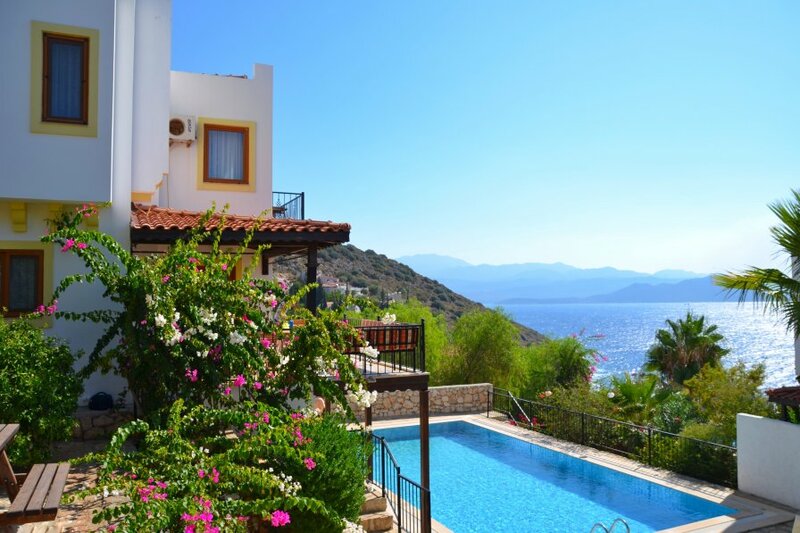 Luxury villa with large swimming pool on the exclusive Kas peninsular with stunning sea views across to the greek island of Meis.. The villa ,which is 250 metres from bathing platforms and the sea ,has stunning views of the Greek island of Meis and the surrounding islands. The sea is extremely clean and regularly is given a blue flag awards. The villas have been decorated in the Ottoman style with decorative wooden coving and ceiling roses. It has been furnished to a high standard and the swimming pool is 12 X 6 metres large. Each room has wonderful sea views and the master bedroom has its own balcony overlooking the mediterranean sea. The villa is situated within a five minute walk of many hotels who are happy to supply meals for those who do not want to cook .